Can Detective Lottie Parker catch a killer and protect her family? The Missing Ones is the first installment in the Detective Lottie Parker Series by Patricia Gibney. When a women is found murdered inside a church Detective Lottie Parker is put in charge of the case. When a second person is killed can Lottie find the link between the two murders? Just as Lottie and her team are trying to put all the pieces of a very complicated puzzle together, a priest goes missing. Is this linked to the two murders? Lottie and her team have a great deal of work ahead of them to find out what links all the pieces together. On top of all of this Lottie is getting heat from her superintendent for her actions and her attempts at going after the local Bishop in connection with the murders and also going at a local well off business man both of whom have complained about Lottie and both who seem to be up to their necks in it in this case. Can Lottie put all the pieces together and figure out who the killer is before more bodies turn up, before her own family and secrets come out. Has this case got anything to do with Lottie's long lost missing brother? 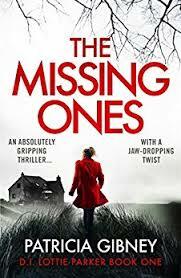 The Missing Ones, This book was chosen as one of the books for my bookclub (Bilsthorpe Bookworms) From reading the blurb i thought this sounded like an interesting read and defiantly my type of book. So what did i think once id read it? I actually really enjoyed it. I found Lottie to be a character you liked, she's had a lot of hard times in her life and she is still going strong. Yes okay she has a slight drinking problem but at least she knows she does. I found i could relate to her when she spoke about her relationship with her mother as my own relationship with my mother over the past year has not been too good. I found myself really rooting for Boyd hoping him and Lottie would get together and become a couple as i found them to be really sweet together and i thought Boyd was a perfect fit for Lottie after her loss. Boyd was another character you found yourself loving. Although he can come across as annoying and he liked to wind Lottie up he never meant any harm in it and always had Lottie's back. I found halfway through the book i had guessed who i thought was the killer but i knew he had changed his name and couldn't figure out which of the characters he was now going by. To then find out i was well wrong completely about who the killer is i thought was really good. I really love it when i can't guess 'who done it' and the book keeps me guessing and questioning right up till the reveal. This to me is a sign of a great thriller novel. I did find the book to be a little long winded, There was a lot of chapters and each chapter wasn't very long. I would have to say this is my only criticism really. I don't like it when books have lots of little chapters rather than a few long chapters. With over one hundred chapters in this book, i felt like the book seemed to never end. All in all i have chosen to give this book 4 out of 5 stars and i have pre-ordered the second book in the series so keep your eye our for the review on book number two.